We recently developed a web app for a client that allows their users to wake up their computer without knowing the MAC address – just their machine name. The app gets the MAC address and default gateway details from the client’s Microsoft SCCM database. All was going well, until we found some machines that wouldn’t wake up. Further investigation revealed that it was only when machines had been shutdown via Windows 7 – ie if the machine had just gone to sleep, or had been powered off using the power button then it would wake up fine. 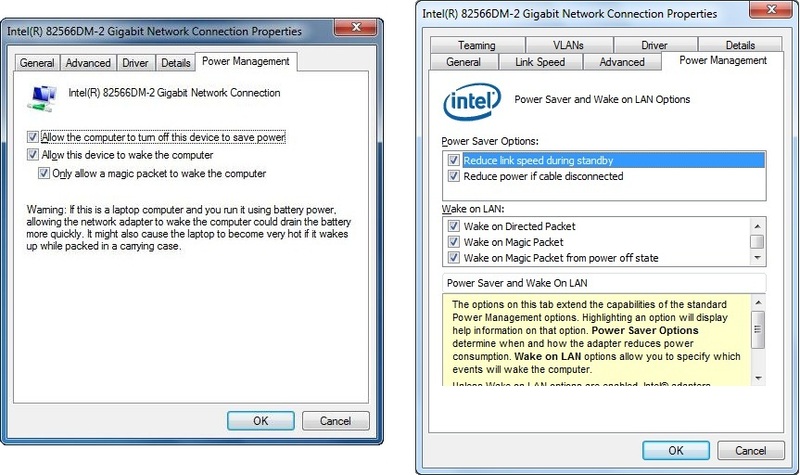 After downloading and installing the latest drivers from Intel, a new Power Management tab appeared when configuring the NIC, and lo and behold, there’s a couple of extra settings relating to Wake On Lan that were disabled. 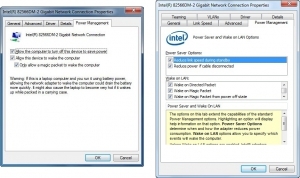 Enabling the “Wake on Magic Packet from power off state” option magically fixed the problem (we enabled the other options while we were at it too).